Single mom Marion Johnson found a small lump between her breasts while she was showering back in May of 2015. She was later diagnosed with stage four breast cancer and given a year to live. After undergoing six months of intensive chemo, her scans revealed that the cancer had spread to her liver. Not ready to say goodbye to her three kids, she decided to look for alternatives. 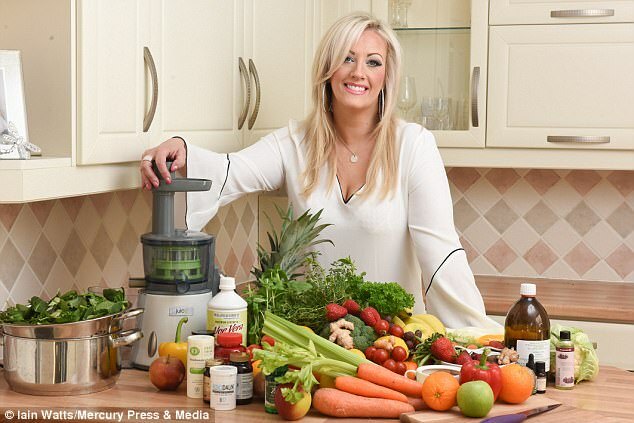 After looking into the benefits of cold press juicing and going vegan, and against the advice of her oncologist, she overhauled her diet and added oxygen treatments and daily vitamins. Currently, one of her tumors has shrunk and the others are stable. Dandelion and burdock tea with lemon. Fruit and vegetable smoothies made in a cold press juicer (it crushes and presses fresh ingredients to keep their nutrients intact). No meat, sugar, alcohol, gluten or dairy. Weekly vitamin C intravenous drips. Initialy the doctors thought they could remove her breast and lymph node but further scans revealed tumors in her spine, stomach, and adrenal glands. Since her cancer was already so widespread the only “mainstream” option left was palliative chemotherapy- which would only prolong her life, not save her OR combat the disease. The strong chemo, which she had every three weeks for six months, was incredibly difficult. After each round of chemo, she’d be ok for a couple of days and then it would hit her so hard she’d be wiped out and in bed for days. She needed help to parent, make dinner, and take care of her home. But, now that she’s flooding her body with good, organic, whole foods and pure oxygen, as well as high doses of Vitamin C, she says she feels fantastic. And one of her friends has set up a Gofundme page to get her get to the Gerson Health Centre in Budapest, Hungary, which specializes in these alternative cancer therapies. If you feel led to help, please do. Good job Marion, we’re cheering for you from this side of the pond! Click here to read my story about how I overcame Lyme and numerous other health challenges. Holistic Doctor Finds Cure For All Disease And Has Court Ruling To Prove So!